With just days to go until the U.S. midterm elections, there are growing fears that Russia's efforts to undermine U.S. democracy extend far beyond the polls on Nov. 6 or the presidential election in 2020. Defense and security officials worry that as part of Moscow's plan to sow division and discord, it is trying to conquer the U.S. military â" not with bullets or missiles but with tweets and memes. The tactic is an outgrowth of Russia's overarching strategy to find seams within U.S. society where distrust or anger exist and widen those divisions with targeted messaging. In the case of the U.S. military, according to current and former U.S. and Western officials, the Kremlin's aim is likely to establish what is known as reflexive control. By seeding U.S. troops with the right type of disinformation, they say, Russia can predispose them to make ch oices or decisions that are favorable for Moscow. VOA spoke with multiple defense and security officials, all of whom declined to comment on the nature or scope of Russia's military-oriented influence operations. Still, almost all of the officials admitted Russia's targeting of U.S. military personnel with influence operations, and the way it is being done, is a concern. "We know it goes on," said Ed Wilson, deputy assistant secretary of defense for cyber policy. "That's why we've amped up and increased the attention that we're paying. "We're taking a renewed look at how we train and educate the broader force," he said, noting that efforts go beyond just the military to the Defense Department's partner agencies. 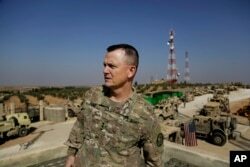 U.S. Army Lt. Gen. Paul E. Funk speaks to the Associated Press at an American outpost in the northern Kurdish town of Manbij, Syria, Feb. 7, 2018. The former commanding general for Combined Joint Task Force Operation Inherent Resolve, Army Lt. Gen. Paul Funk, described the need to educate and shield troops from disinformation campaigns as a matter of "force protection." "It doesn't matter if it's a physical force or an information force," Funk said. "Are you concerned about it? Of course. Do you have to have campaigns where you inform your soldiers of those kinds of things that happen? Sure." Officials and experts say Russia's use of influence operations to target the U.S. armed forces sh ould come as no surprise. Russian President Vladimir Putin has tested the approach, using social media especially, in places like Ukraine, and since then it has become an ever more critical part of Russia's overarching strategy. 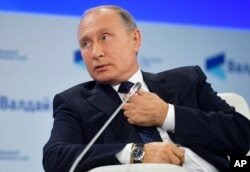 Russian President Vladimir Putin speaks at a meeting of the Valdai International Discussion Club in Sochi, Russia, on Oct. 18, 2018. "There's nothing new with Russia or the Soviet Union wanting to have that degree of influence," Lt. Gen. Robert Ashley, director of the Defense Intelligence Agency, told an audience at the Center for Strategic and International Studies in September. "This is really kind of something that is in Putin's DNA as a former KGB a gent." U.S. officials have been aware of the effort for some time. At least as far back as March 2017, a Defense Information School presentation to Army public affairs officers identified disinformation on social media as a high-risk problem, capable of eroding "trust and confidence" in the ranks as well as in the Army as a whole. But much of the military's focus in dealing with social media, at least from what has been shared publicly, has concentrated on scams targeting military personnel, or on inappropriate or even unlawful behavior. Some top U.S. officials have tried to downplay the dangers of Russia's influence operation, saying in some ways the threat posed to U.S. troops is no different from the threat to anyone else. Defense Secretary Jim Mattis speaks during the 2018 POW/MIA National Recognition Day Ceremony at the Pentagon in Washington, Sept. 21, 2018. "Like all Americans, we have to be alert to the people who would try to manipulate an election in the information age, when there's so many feeds coming in to everybody," Defense Secretary Jim Mattis said when asked about the threat in August. "Certainly, we pay attention to that," Mattis said. "But it's part of the larger domain of protecting America." Experts worry that simply treating the Russian influence operations targeting the military as an American problem and not a military problem has left the U.S. military vulnerable to Russia's social media onslaught. 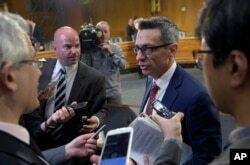 Clint Watts, a Senior Fellow at the Foreign Policy Research Institute Program on National Security, talks with reporters on Capitol Hill in Washington, March 30, 2017, following his testimony before the Senate Intelligence Committee hearing on Russian intelligence activities. "U.S. military personnel and veterans â" it is the uncovered stone in the Russian influence effort that no one is really taking enough of an interest in," said Clint Watts, a former FBI special agent and now a senior fellow at George Washington University's Center for Cyber and Homeland Security. And Watts, who has testified before Congress on Russian influence operations, thinks the Russians have already made considerable headway. "At the enlisted ranks in the U.S. military, Russia won over a huge base of support in this country that still continues on today," he said. Some of the early Russian success could be traced back to the 2016 U.S. presidential campaign, when their push to sway the election in favor of then-candidate Donald Trump, amplifying messages like "America First" and his tough talk on terrorism, may have resonated with rank-and-file members of the military. Democratic presidential nominee Hillary Clinton speaks at a campaign rally in Pittsburgh, Pennsylv ania, and Republican presidential nominee Donald Trump gestures as he arrives for a campaign rally in Raleigh, North Carolina, Nov. 7, 2016. A May 2016 unscientific survey by the Military Times found "Donald Trump emerged as active-duty service members' preference to become the next U.S. president, topping Hillary Clinton by more than a 2-to-1 margin." More recent polling by Military Times and the Institute for Veterans and Military Families (IVMF) at Syracuse University suggests opinions may be changing. More than 70 percent of troops surveyed said Russia was a significant threat, an increase of 18 percent from the previous year. Yet experts and former officials say there is evidence to suggest Russian influence operations targeting U.S. military personnel and their families have continued unabated. "Whether that's Facebook, Twitter and others, we're seeing where it [Russia] is focusing o n identifying affinity groups," said Heather Conley, a former deputy assistant secretary of state during the administration of U.S. President George W. Bush. Now a senior vice president for Europe, Eurasia and the Arctic at the Center for Strategic and International Studies in Washington, Conley says the military is just one of several such groups in Russia's sights, such as law enforcement and religious organizations. "These unwittingly are being used to promote disinformation and malign influence," she said. "It starts identifying the key voices within these broader groups." At least in part, Russia has been trying to reach out to those voices on platforms like Twitter, using fake accounts purporting to be those of Americans with ties to the military. 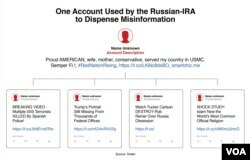 In Twitter's lat est release of accounts linked to Russia's Internet Research Agency (on Oct. 17), at least 39 had user descriptions promoting links to the military. Some gained little to no traction, like one that described the user as "Fighting to *Make America Great Again* strong #military supporter. Combat #Vet ??? ?#OORAH Ret. #Frogman ???? #Sheepdog #Patriot ???? Follow me," which did not attract a single follower. Others did better, getting hundreds of followers. One Russian account, describing the user as a "Proud AMERICAN, wife, mother, conservative, served my country in USMC," had more than 2,000 followers. "We certainly are still seeing a lot of the accounts that we're looking at that continue to have what seemed to be clear military connections," Bret Schafer, a social media analyst for the German Marshall Fund of the Un ited States' Alliance for Securing Democracy, told VOA. Schafer, along with his colleagues, have been studying Russia's outreach on social media to U.S. military personnel and their families. He said the use of terms like "veteran" or "Navy mom" is not unusual. "You'll see a lot of banners on Twitter, the account pictures that will be kind of non-identifiable in terms of a specific person, but a member of the military or just some sort of graphic that connotes that person is part of the military or a family member," he said. Still, Schafer said it is difficult to determine just how much Russia has managed to penetrate the U.S. military community, whether on Twitter or other social media platforms, like Facebook. "My guess is a lot of this probably would be happening more in closed Facebook groups in which there are many with the military, and frankly, nobody has any idea what's really happening for th ose groups, because of course Facebook doesn't share those with researchers," he said. And there are worries that the U.S. military may be especially vulnerable as officials admit the defense community's connection to the rest of the country is as weak as it has been in a long time. "My concern is the broader isolation from the community we serve, and that's a discussion [in Congress] as well," Army Secretary Mark Esper said during a breakfast forum in August. "On the Army staff alone, you look at any number of the senior leaders, I think they all have at least one son or daughter, if not more, who are army officers or who are serving." "We've become more segmented," said Sen. Jack Reed, D-R.I., the ranking member of the Armed Services Committee. "I'm very concerned about that." Reed, like Esper, downplayed concerns that the problem is one the Russians could exploit. "I can't think of an institution that's more committed to America, one America and one that's governed by the Constitution, than the military," he said recently. But U.S. allies say there is reason to worry as they have seen Russia use disinformation to repeatedly target their forces. "We have seen attempts to erode trust within the alliance," NATO spokesperson Oana Lungescu told VOA by email. NATO's Strategic Communications Center of Excellence in Latvia, working with the Atlantic Council's Digital Forensic Research Lab, has seen several large-scale disinformation campaigns and also smaller-scale attacks targeting NATO's enhanced forward presence in the Baltics. "Our personnel get guidance and instruction regarding misinformation and information security as part of their pre-deployment training and their arrival pro cess in order to increase their resilience," according to Maj. Mark Peebles with NATO's Task Force Latvia Headquarters. "They are aware that it's out there and are advised to maintain a critical eye to what they see on social media," he said. The British, too, have seen indications that Russia and others may be trying to cause dissent in the ranks. "Quite a few senior commanders, increasingly, I see now, having had evidence of false Facebook websites coming up routinely in their names," said Lt. Gen. Nick Pope, British army deputy chief of the general staff, describing efforts to take the fake pages down as "whack a rat." "The fact is that our potential adversaries, hostile agencies, are using cybercrime, if you call it that, as a mechanism now to try to unhinge reliable, evidence-based platforms," he said. Jeff works out of VOAâs Washington headquarters and is national security correspondent. You can follow Jeff on Twitter at @jseldin or on Google Plus.